Some of the unprecedented retail shopping experiences featured at Etisalat’s stand include a self-driving grocery store, robotic shopping cart that leads visitors to the grocery isle, a smart dressing room that recommends fashion apparel, a smart vending machine, a state-of-the-art unmanned cash counters and self-checkouts. This year visitors can witness the world’s first self-driving grocery store, ‘Robomart’ has taken the idea of grocery delivery to a new level. Just tap a button and the entire store comes to you so that you can shop checkout free for the freshest goods right at your doorstep. ‘Robomarts’ are fully electric road vehicles engineered with cutting-edge technology, including driverless tech for autonomy, tele-operations for safety, a check-out free system, and a purpose-built refrigeration for cooling. Etisalat has a new autonomous retail solution using technologies such as AI and computer vision, which can detect products taken or returned to the shelves and keeps track of them in your virtual cart. This is showcased for the first time globally, it has no cash registers, as customers can simply pick out what they fancy and walk out. Shoppers no longer have to wait in line at the till – they enter, take the product that they want and leave. 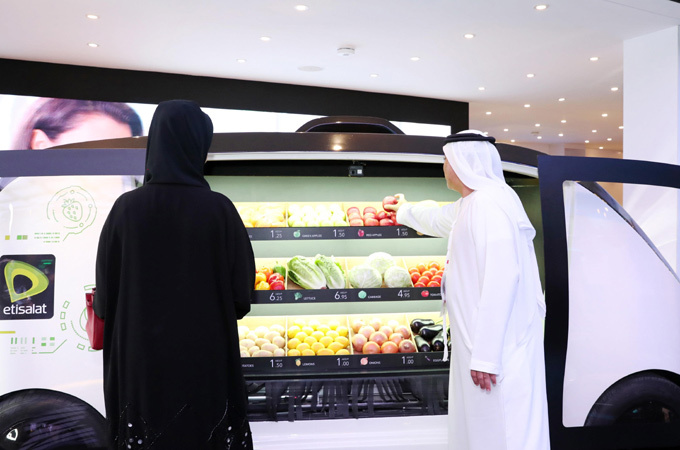 One of the highlights at Etisalat stand’s retail zone is the ‘Unattended Store’, considered the most sought-after innovation in today’s marketplace. The key here is to optimise the shopping through AI. Currently, most unattended stores use RFID technology, which has limitations in terms of recognition. The ‘AI Cooler’, which adopts a pure-vision solution and uses two cameras to dynamically recognise the actions of taking items out and putting them back, provides a real ‘take and go’ check-out experience. Consumers just need to scan the QR code on the cooler’s door (or swipe their face) to open it. They can pick up any item, and the payment will be made automatically after the door is closed. Another major highlight is the ‘AI Checkout Machine’, where customers just need to put their items on the check-out counter without having to look for the barcodes or distinguishing items from non-standard ones. The screen will directly display the prices of their items, and they can pay for their purchases using mobile payment methods.